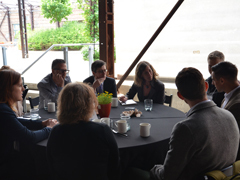 Reflections from Accelerate 2014: What does it take to collaborate? 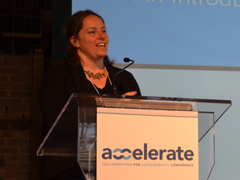 It was fascinating for me to participate in and observe the unfolding of our recent Accelerate: Collaborating for Sustainability Conference. The convening of people was intended for a common purpose—to share our learnings so we are better abled in our collaborative efforts in transitioning to a sustainable society. We really dug into the practice of it all during this two-day conference. I have been reflecting on my experience and fondly remember a wave of a-ha moments, moments of wanting to debate ideas, and moments of simply connecting with other practitioners. Between the awesome food and deep discussions, one overarching element that ran through the two days was what it takes to collaborate to affect systems change. Convene and gather the diversity of the whole system. Use learning journeys to help these people see that their paradigm is part of the problem and there is a need to see the system from one anothers’ eyes. Then work together to take effective action. Senge then shared his magic ingredient to brew a different kind of conversation: the space to hold the energy of the conversation or what he called "the art of hosting." These words sound so simple as I write them and yet executing on them is where the complexity lies. In our experience with the Sustainability Transition Labs, success requires dealing with this complexity rather than simplifying it into its parts and creating new to do lists to deal with the fragments. Mark Cabaj, our closing speaker for the conference, inspires me to approach complexity as acting, reacting, and adapting to what develops. The process of collaborating is not about seeing the issue in the same way or compromising/fighting toward agreement, but rather developing a deep appreciation of our different points of view to see the whole picture. In doing so, it means working together, failing together to learn, and adapting intelligently and constructively to what emerges before us. This is what Ashley Good has termed "failing intelligently." Effective collaboration is about leaping into the unknown together and trusting that the net will appear. When I reflect on Accelerate, I see the grand potential that lab-like approaches have for change. 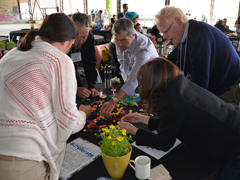 The Sustainability Transition Lab offers transformative approaches to innovative systems change through the shifting of relationships of those players in the system to see the system from one another’s eyes and to work together to transition it toward a sustainable system. We are grappling with wicked issues in multiple systems in the hopes that playing with these complex systems will help Canadians ask different types of questions, see their efforts within a system, and effectively shift systems to build a thriving society. 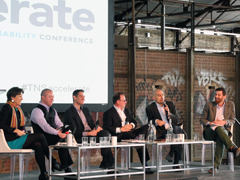 To learn more about the conference please visit our Accelerate 2014 summary page.